It's hard to believe that Oxford Exchange in Tampa has been opened for over a year. A year later and they are still going strong, serving delicious food, tea and coffee while offering up a unique shopping experience. If I had Daddy's credit card, I could do some major damage in there. 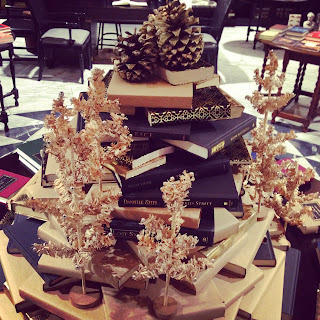 The beauty of Oxford Exchange is what will first grab your attention. You can check out my Oxford Exchange blog post from last year for more interior photos. Oxford Exchange is a book store, gift shop, restaurant, coffee and tea bar, originally built in 1891 as a stable for the Plant Hotel. When Oxford Exchange was built, they kept so much of the history in the building. You get a great feel of modern contemporary to comfortable European elegance. Last week, a group of bloggers in the Tampa Bay area got a first look at the Holiday's at OE. We learned how to make Party Appetizers in a Pint from OE's Executive Chef Erin Guggino, (Butternut Squash Soup Shooters & Dried Figs with Goat Cheese & Toasted Walnuts). I'm looking forward to trying both of those out this holiday Season. We then sampled on tea & chocolate and coffee & chocolate pairings. This was a first for me! Tebella Tea Company showcased their amazing Peppermint Bark tea paired with Mast Brothers Dark Chocolate with Crown Maple. Meanwhile Buddy Brew paired their coffee with Dandelion Chocolate. What really grabbed my attention was the OE vendor, Seventh Avenue Apothecary, whose store is located in Ybor City. I had no idea this place existed in my backyard. Seventh Avenue Apothecary is a family owned & operated company pouring small batches of candles in Tampa, FL. They have signature scents which honor the history, culture and culinary legacy of Ybor City. Upon reading their menu, I realized quickly that this was no Yankee Candle Company. They have very unique and amazing scents. Seventh Avenue Apothecary Candles are well worth their price tag. And one of my lucky readers is going to get one of their very own! I was given a Teak & Cardamom candle, the signature exclusive scent of Oxford Exchange, to giveaway! This candle has a burn time of Approximately 55 hours, made with all natural soy wax, free of dyes, with natural coated cotton wick. Scroll down below to enter on the rafflecopter widget, and make sure you leave a comment letting me know which of the scents you would love to smell in your house. Click here to see their entire lineup. 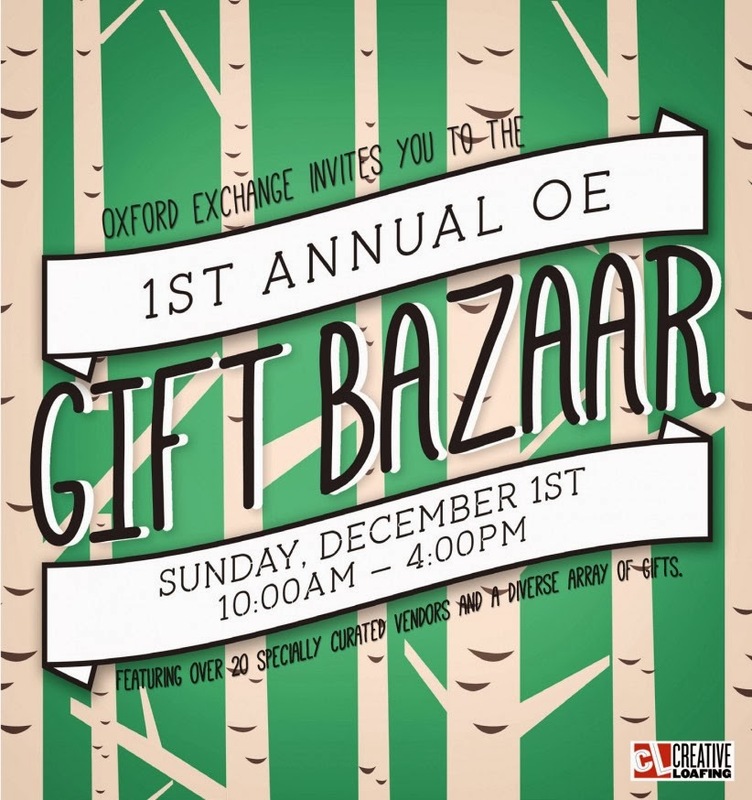 If you area n the Tampa area on December 1st, OE is hosting their 1st annual Gift Bazaar, where you can get a first hand look of what we experienced. You can also check out OE's entire calendar of events to see what is happening, including their new and very popular, bingo night! Pomegranate & Grapefruit!!! Very cool this candle place is in Ybor - we will have to check it out next time I am in town. I would love Frasier Fir and Thyme but all of the scents sounded like really great combinations. Also I am using my friend's computer (who registers as Buddha in rafflecopter) to enter this giveaway. Sorry I didn't notice and forgot to log myself in...hope that makes sense. Wow- they all sound so wonderful. I didn't know this shop was in Ybor either! I would say I would be most interested in the honey and peanut butter or peppermint and roasted marshmallow. 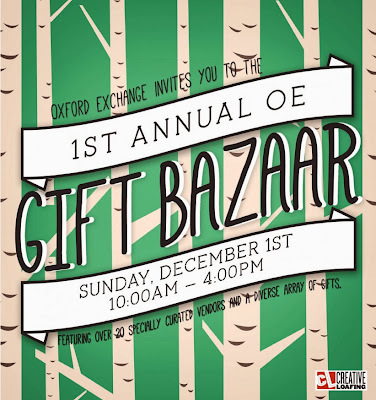 I still can't believe I haven't made it over to Oxford Exchange yet...seems like it was just opening yesterday! I need to get on top of things; it always sounds like a great spot!